Triple The Gains From Your Weight Workout! Get the benefits of training for strength, hypertrophy, and muscle endurance in this jack-of-all-trades 4x4 workout. There is no one perfect workout. The exercises you do and the way you do them depends on your goal. If you're a powerlifter, you train with very heavy weights for low reps. If you're into bodybuilding, you go with more moderate loads for slightly higher rep targets. If you're an athlete and want to develop your muscular endurance, you use lighter weights and more reps to develop more aerobically efficient muscles. But what if you're not interested in focusing specifically on strength, size, or endurance? What if you want a little of each? Can you be a jack-of-all-trades but master of none? Hey, you can do anything you want! And you can do it all with 4x4 training. The 4x4 training system is designed to improve your strength, size, and muscular endurance in a single workout. After warming up, you train to develop each of these characteristics, starting with strength, then muscle size, then endurance. Bonus: By doing high-rep training toward the end of the workout, you give your muscle pump a wicked boost as high reps push fluids into your target muscle group. Generally speaking, it's best to train with specific goals in mind and tailor your workouts accordingly. But maybe your goal is to get more broad-based fitness benefits—or maybe you're super busy and want to cram it all into one short, efficient workout. There's nothing wrong with not wanting to specialize your training. It's just a matter of training to your goals. In the 4x4 system, you do four exercises for a given muscle group, with each movement working the target body part from a different angle. This is not unlike how you'd put together a traditional bodybuilding workout, but that's where the similarities end. What makes the 4x4 protocol unusual is that each exercise provides a unique training stimulus. Each of the rep targets is a multiple of four. Do four reps of the first movement with very heavy weights to focus on building strength. 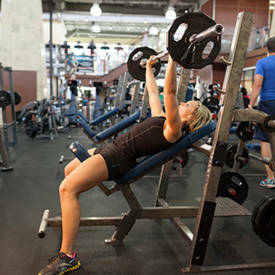 Do the second with relatively lighter weights and a target of eight reps. This focuses on the lower end of the muscle-building rep range, which encourages biochemical changes in your muscles that enhance growth. Do the third exercise with even lighter weights and a target rep of 12, to work the target muscle at the upper end of the hypertrophy rep range. Do the fourth and final exercise with very light weights and a target of 16 reps, to boost muscle endurance. Choosing the right load is key because you want to reach each rep target near muscle failure. 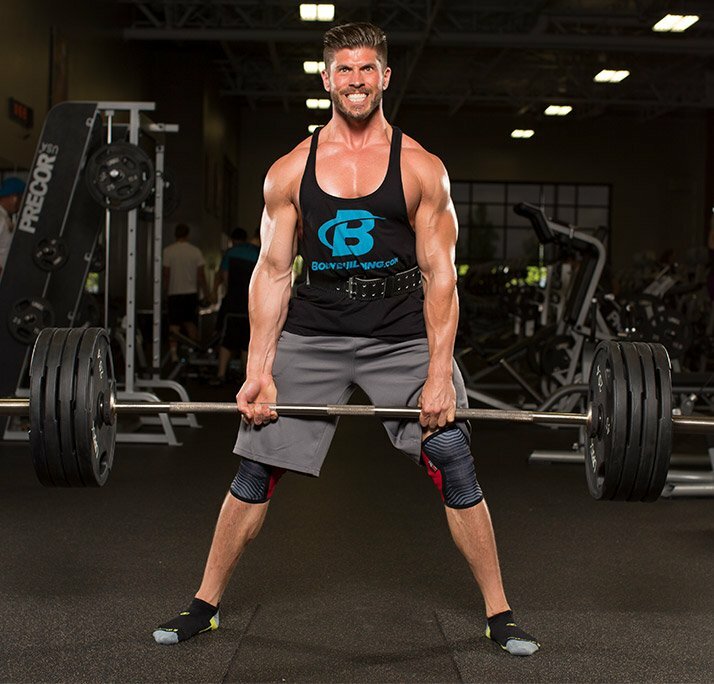 If you're not familiar with the weights you should use, the Bodybuilding.com rep calculator can help you determine your one-rep max (1RM) which you can then use to calculate your other RMs. The calculator doesn't estimate 16RM loads so just use 60 percent of your 1RM to figure out your 16RM. Why use multiples of four? For one thing, this approach fits neatly within the rep ranges exercise scientists have established for achieving various training goals. Plus, it's a pretty easy system to remember. You could easily vary the formula and use multiples of five or six. The main thing is that you want to keep your rep targets within the optimum training zones. If you choose a 5x5 workout, you'll have to start with your 5RM, which will be lighter than your 4RM. 25 Gram Protein Complex With Milkshake Taste, With 5g BCAAs and 5g Glutamine To Fuel Your Results! Here's a sample 4x4 workout for your back. The exercise order can be changed to some degree, but always start with your major mass-builders and finish with single-joint moves. Always do a good warm-up before handling heavy weights: Your joints will thank you, and you may be able to lift more weight. 3 sets of 4 reps, rest 180 sec. 3 sets of 12 reps, rest 90 sec. 3 sets of 16 reps, rest 60-90 sec. Because you're starting the workout with heavy weights, you really have to warm up your body. 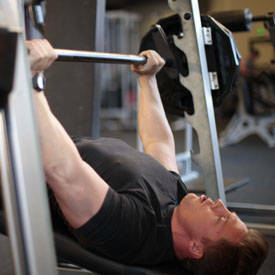 Do several lighter sets, pyramiding the weight up on each successive set. Never take warm-up sets anywhere close to muscle failure. When choosing strength and size movements for lower-rep targets, do mass-building, multijoint exercises like basic bench presses for chest, squats for legs, overhead presses for shoulders, and deadlifts and rows for back. These big movements enable you to push the most weight and engage the greatest degree of your body's musculature. This gives you a better anabolic stimulus than single-joint movements. Save those isolation exercises for your very high-rep sets. In general, do free-weight exercises at the front end of your workout because they're more demanding. Dumbbells allow a longer range of motion than barbells and are a lot harder to control, which requires greater stabilizing activity. Using dumbbells means you will probably have to back off slightly on the weight. Machine exercises are best done last when you don't have to expend energy for stabilization and can put all of your attention on lifting the weight. 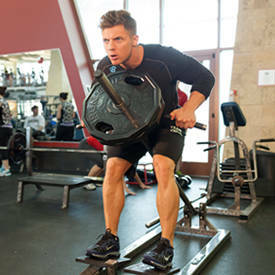 Because of the very heavy weights involved in some of these exercises, recruit someone to be your spotter, or at least do the heavy lead-off exercises in a power rack with the safety bars set at the lower end of the range of motion. 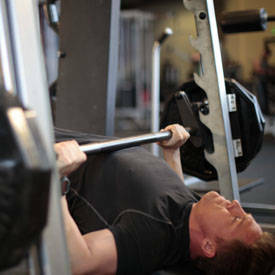 You can also use a Smith machine. You can arrange a 4x4 workout in more than one way. Probably the simplest way is to do it as prescribed in the back workout above: Do all of the first exercise sets to four reps, the second for eight, and so on. Or you can take the first set of each exercise to four reps, the second set to eight reps, the third to 12, and then add a fourth set to 16. The drawback of this style is that you have to change the weight for each set, and you'll need to know your RM loads for each rep amount. There's obviously more volume here because you've added a fourth set, so consider reducing the number of exercises if you're looking to keep volume nearly the same. When doing single-joint exercises on the alternate rep scheme, drop the 4-rep target; that's too much weight to put on your joints. Simply do the 8-, 12-, and 16-rep targets. The 4x4 system isn't very well known, but it's a great way to get multiple benefits from a single workout. In the end, 4x4s can help you become big, strong, and fit.